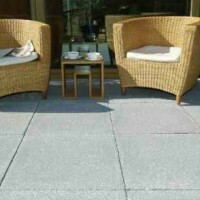 Patio Paving Prices. Fast online paving quotes. 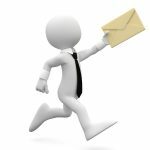 We can provide you with competitive patio paving quotes from a database of authorised paving companies around the UK. 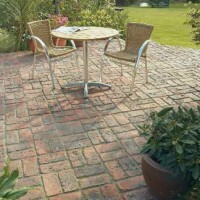 If you are looking to renew your patio paving, complete our online form today. Patio paving is normally for pedestrian use only which means that it doesn’t have to be designed to cope with the weight of your car. 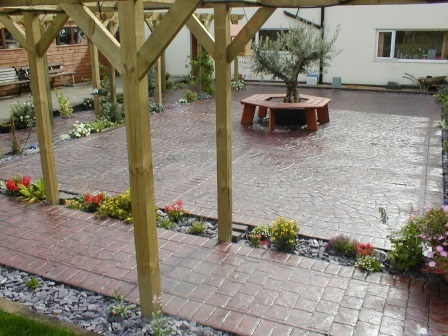 Patios can also be designed to be more decorative than your driveway, with paths, seating areas and spaces for planting trees, shrubs and flowering plants. If you are completely redesigning your rear garden it makes sense to install the hard landscaping sections first, although you are probably going to keep any prized trees or specimen shrubs and design you garden around them. Whether you are designing a play area for your children, a place to entertain or perhaps a secluded place where you can sit and enjoy a book, a hard landscaped patio paving area is an ideal complement to any garden. Block Paving is one of the most popular choices for both patios and driveway in the UK due to the enormous choice of colours, textures, shapes and layout patterns of the blocks. Block paving is ideal for patios as it allows shapes and curves to be formed to provide seating areas, paths and planting areas; usually with different blocks used as a border. 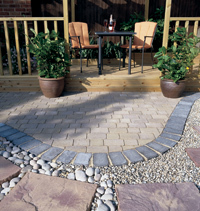 Block paving can be used to great effect when complemented by areas of gravel, pebbles and flag stones. 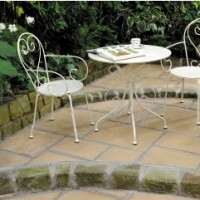 Natural Stone Paving such as polished sandstone which can be installed perfectly flat and level provides the perfect surface for a patio area where tables and chairs are to be placed. Whilst the riven surfaces of sandstone and granite of the rippled surface of limestone are ideal for paths and general garden paving. 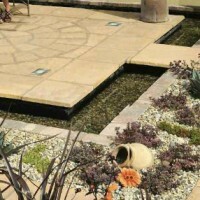 Natural sandstone, limestone, granite and slate are all available in a wide range of colours, textures, sizes and shapes for you to design a unique patio. Pattern Imprinted Concrete is strong enough to use on domestic driveways but because it can be formed to create curves and shapes, it is also superb for patio paving, planting areas and garden paths. Pattern imprinted concrete reproduces the colour and textured effect of natural paving including stone, slate, cobbles, brick, slate or even timber boards. The concrete is laid within shaped formwork or shuttering, it is then coloured with powdered pigments before printing mats are pressed into its surface to form the pattern and textures of your chosen style of natural patio paving.